madebyzen Essential Oil Blend - Tranquility is soothly blended with bergamot, blackcurrant, sandalwood and spearmint, helping distress and unwind whilst infusing the air with a touch of serenity. Try these essential oil blends with our recommended madebyzen Aroma Diffusers. Using pure essential oils, madebyzen has created the ultimate collection of essential oil blends that are unique and desirable. The blends are 100% natural and use the purest essential oils. Inspired by the beauty of pure, timeless and modern design, madebyzen is a British lifestyle brand, dedicated to bring a touch of beauty, luxury and enjoyment through it`s burgeoning collection of home accessories and fragrances. Essential Oil Blend - 15ml. Keep away from children, pets and sensitive areas (I.E eyes). Do not take internally or apply undiluted to skin, may produce an allergic reaction. If pregnant or suffering from a specific condition, please seek medical advice before use. Avoid contact with polished or synthetic surfaces. Keep away from naked flames or source of ignition. A blend of pure essential oils. Suitable for use with Ultrasonic Aroma Diffusers, Oil Burners, Lamp Rings, Pot Pourri and Dried Flowers. Must be diluted with carrier oils or base products for skin/bathing applications. Use with caution and check manufacturers warnings when used with other products described. 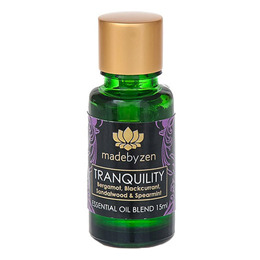 Below are reviews of madebyzen Essential Oil Blend - Tranquility - 15ml by bodykind customers. If you have tried this product we'd love to hear what you think so please leave a review.